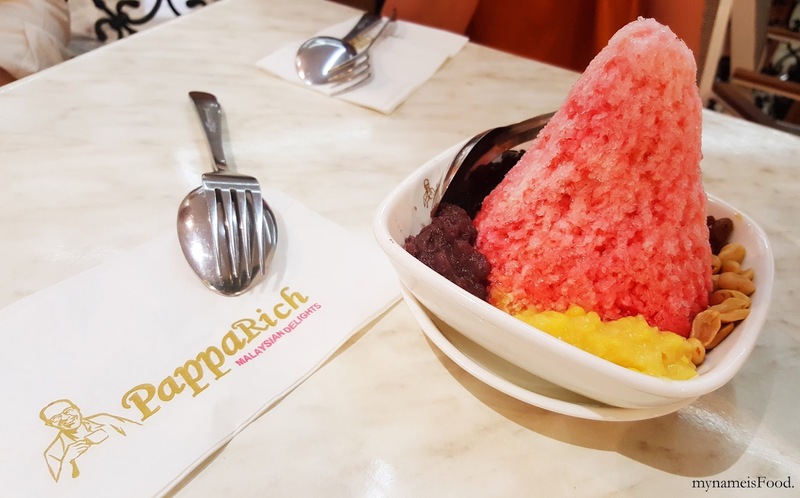 PappaRich, Wintergarden, Queen Street Mall, Brisbane CBD - my name is Food. 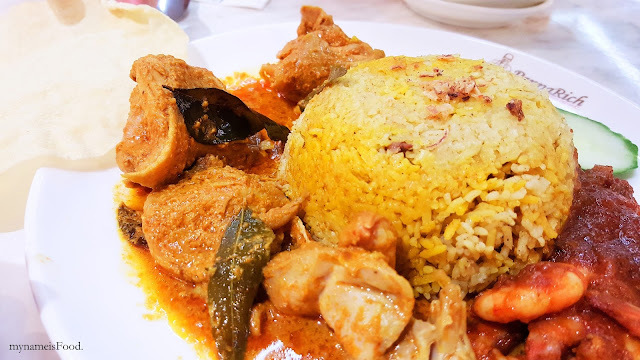 'Biryani Rice with Curry Chicken and Sambal Prawns' ($13.90) is simpler than your typical Nasi Lemak as it only consists of a tipped over bowl of rice (you do have a choice of normal white jasmine rice or biryani rice) with sambal prawns and curry chicken. The curry chicken had succulent chicken thigh pieces however there seemed to be not enough sauce and was abit bland overall. The sambal prawns was quite nice and juicy, having the spices marinated both inside and out. 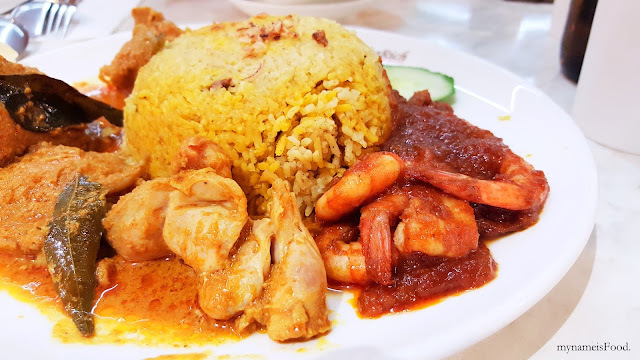 It would have been better if there were more sauce for both elements, the curry chicken as well as the sambal prawns as the sauce do get absorbed quite quickly by the chicken and also the prawn resulting in just plain biryani rice without anything to eat it with. 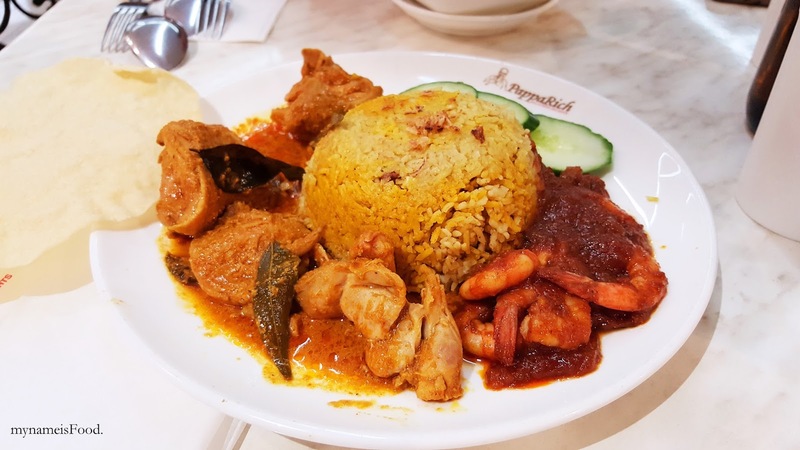 The biryani rice was quite okay, not bad, a good substitute for normal jasmine rice. 'Curry Laksa (Vegetables)' ($13.90) is your typical Laksa with hokkien noodles as the main carbs but instead of having chicken and vegetables, this is just solely vegetables. Although it may not have chicken but I do have to say that the portion and the amount of vegetables as well as the thick chunky cutting made it all worth it. A variety of vegetables were in it including bean sprouts, tofu, beancurd skin, fish cake, tofu puffs and tomatoes. 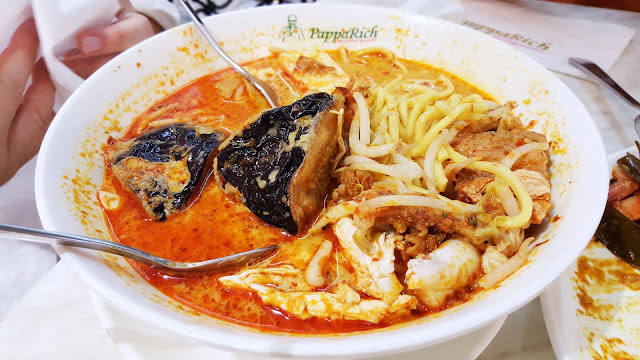 The spicy coconut gravy of the laksa base was just right having the hint of spiciness but also allowing the marination to go through each of the different ingredients in the dish. 'ABC' ($7.90) also known as Ice Kacang which Kacang means peanuts. Shaved ice with syrup, grass jelly, creamed corn, peanuts, red bean and also smashed red bean. Although it may not be your typical dessert but it is in Malaysia as well as in Singapore and Indonesia though each countries do have their own versions and may call it differently. A nice and refreshing dessert though I did find that the syrup was just right, not too sweet however, the condiments on the side seemed to be abit lacking in terms of portion leaving you with more ice than the accompanying elements. The only downside of the dining was the waiting time after ordering. Being quickly seated at our tables after a short queue, we ordered quickly after we browsed the menu but waiting for the food to come seemed like it took forever. The dessert actually came first which didn't really make sense for us but the laksa took forever to come. The biryani rice with the curry chicken came about 20 minutes after ordering but the laksa came about 45 minutes or so and we had to enquire about it numerous times to the waiter. Having planned to cancel the order if it would take much longer, the different waiters we had asked would keep saying it is being made or it will come soon or it is coming and yet, it still came very long after.